THE PUBLIC ACCOUNTS Committee will hold a meeting in private session this afternoon in order to discuss the latest controversy surrounding the Rehab Group. The meeting will begin around 5.30pm with members of the Dáil’s spending watchdog to discuss a number of issues in relation to Rehab, which supports people with disabilities, and other section 38 and 39 organisations. 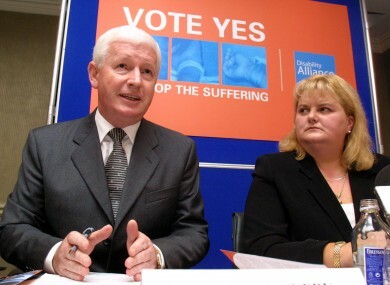 The committee is likely to discuss the possibility of compelling former Rehab CEOs Frank Flannery and Angela Kerins to appear before it after they failed to attend a hearing last week. Committee chairman John McGuinness said it is his personal view that PAC should compel Kerins and Flannery to appear, but said this was up to the committee to agree on. “I’m also anxious to bring the investigation into Rehab to a close and to report to the Oireachtas as soon as possible because it’s doing huge damage to the charity sector,” he said. Members are likely to raise the disclosure last weekend that Rehab paid a board member some €2.5 million for consultancy work over an 11-year period. John Hussey received an average of around €200,000 pee annum from 1994 to 2005 for management consultancy services, according to the Sunday Independent. He sat on the board of Rehab between 1994 and 2004. McGuinness said that other organisations including the Rotunda Hospital and St Michael’s are also likely to be called to appear before the committee in the coming weeks as part of its examination of organisations that receive funding from the HSE. The PAC is also awaiting a report from the interim administrator at the scandal-hit Central Remedial Clinic which is due shortly. Email “The PAC is having another meeting about Rehab later - but you're not allowed to watch it”. Feedback on “The PAC is having another meeting about Rehab later - but you're not allowed to watch it”.